Saia da trilha turística e tenha uma aventura neste passeio de dia inteiro de 4X4 ao vulcão das Sete Cidades. Não precisa se preocupar com a navegação, pois você terá um motorista durante o dia, que o levará para áreas que não podem ser acessadas por transporte público. Parada em pontos de vista incríveis durante todo o dia incluiu Pico do Carvão, Mata do Canário e Cumeeiras. Um passeio perfeito para admirar as obras-primas vulcânicas naturais de Ponta Delgado. 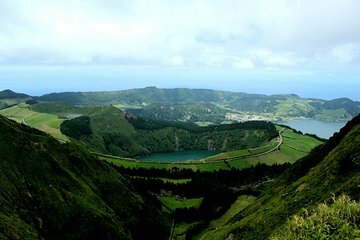 This was one of the highlights for our entire trip to Azores. Jose, the owner of this company, and is a solo operator , was very accommodating, knowledgeable and extremely hospital person. We were lucky, since no other people joined us and the tour become a private. He mentioned at the beginning of the journey that his trip always are on guest's wishes, schedules, no rush. He showed all the interesting spots: we went to the peak of the volcano and observed the stunning views of the seven lakes drove to unpaved roads thanks to his superior 4X4 all-terrain Nissan while explaining the history, flora and fauna, traditions and current developments in St. Miguel. We have a great lunch the traditional Azores food wine, beer, etc. and then continued to the ocean part, Mosteiros where we were swimming in natural thermal pools with the direct access to the ocean - amazing experience, much better than Caldeira Velha we went their 2 days before this trip and were very disappointed. One interesting fact - since Jose spent almost his entire carrier as a supervisor for the local water authority, he showed us a couple of the water wells and explain how the whole system works - very insightful and interesting part of our journey with Jose. We were back to our hotel around 7:30-8.00 pm, and we very lucky to have this trip with Carpe Diem. The only disappointment that we booked this trip as the last day before leaving San Miguel - the early dates were unavailable in Viator Jose is very popular and his trips are always in high demand. My advice to fellow travelers - you should book earlier in advance for the amazing experience.